Until now, animal rights protesters have made all the noise in a dispute over a new research lab in Oxford. But this weekend the city's famed academics are planning to hit back just as loudly, as pro-testing campaigners hit the streets. According to one Oxford academic, a war is looming over "scientific freedom" and the "future of progress", no less. And this Saturday the battle for and against testing will shift from the city's dreaming spires to its historic streets. Over the past two years there have been regular protests by anti-vivisection groups against Oxford University's plans to build an £18m biomedical research laboratory, at which there will be testing on animals. The university says the laboratory is essential for scientific inquiry and for pushing forward medical research and methods. Animal rights groups claim it is unnecessary, that it will be a "prison" for animals which will be treated extremely cruelly by men in white coats. Anti-vivisection protesters have continually marched on the half-built lab, while at the more extreme end, the Animal Liberation Front (ALF) has issued threats and carried out acts of violence to put pressure on Oxford University to stop building the lab. ALF has declared all staff and students at Oxford to be "legitimate targets" and admitted it was behind an arson attack on Hertford College boathouse in 2004. Last year there were eight attacks involving incendiary devices, linked to protests against the laboratory. These sometimes violent interventions seem to have had an impact. 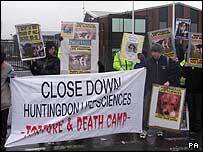 In 2004, a contractor hired to build the lab pulled out following threats from animal rights activists. Some of the builders currently working on the project wear balaclavas, lest they be photographed by extremists and possibly targeted for harassment or assault. And it was recently reported that sections of the lab are being built at a secret location, to be transported to the increasingly volatile construction site only when it becomes safe to do so. Now, however, some Oxford students and academics are launching a fight back in defence of animal research. Angered by the constant disruptions caused by the weekly demos and the threats of violence - and by having been labelled "legitimate targets" - they are taking direct action of their own to defend the building of the South Parks lab. "Medical research involving animals is essential to medical progress", says Iain Simpson, spokesman for the new student group Pro-Test. "And while diseases such as cancer and AIDS continue to kill millions, we are not just justified in continuing with animal research, we have a moral responsibility to do so." Pro-Test was set up by a 16-year-old school pupil at the start of this year, and has since won the support of Oxford students tired of the constant anti-animal testing demos. Its aim is to defend "science, reasoned debate and, above all, the welfare of mankind". It already seems to be making inroads with the student body. A poll of Oxford students found that 85% supported animal testing and 65% thought the launch of Pro-Test a good idea. Pro-Test's first big protest, its maiden demo, takes place on Saturday, and will coincide with a rally organised by an animal rights group. Observers are worried that sparks could fly. Mr Simpson says animal research is too important to go undefended, and argues that students should back it loudly and passionately. "The benefits to mankind from research on animals are vast", he says, pointing out that vaccines for chicken pox, cholera, influenza, measles, mumps, polio, Whooping Cough and various other diseases that once stalked mankind were developed through testing on animals. Other medications, including insulin, penicillin, painkillers and chemotherapy, as well as medical devices such as pacemakers, artificial hearts and valves and artificial hips and knees, were also made possible by medical research involving animals. "Animal testing is absolutely necessary", says Mr Simpson. "And yet there is a popular misconception that these research facilities exist solely to put shampoo in rabbits' eyes." Pro-Test is part of a wider effort to defend medical research involving animals. The Research Defence Society, which has long defended animal experimentation, is upping the ante, while a group previously known as Seriously Ill for Medical Research has re-branded. Made up of patients who support the use of animals in research, it has been relaunched as Patients' Voice for Medical Advance. Various Oxford academics and political figures have come out in support of Pro-Test. Its upcoming demo will be addressed by John Stein, Professor of Physiology at Oxford, and by Evan Harris, MP for Oxford West and Abingdon. James Panton, a lecturer in politics at Lady Margaret Hall college, Oxford, will also be taking part. "Animal experimentation is not something we should be ashamed or embarrassed about", he argues. "The use of animals in research to develop medicines that save human lives is a moral good." Mr Panton believes one reason why exasperated students have had to take matters into their own hands is because figures of authority have been unwilling publicly and robustly to defend animal research. 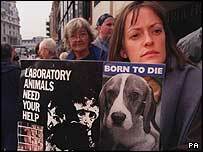 "The government has been far too half-hearted in its support for the laboratory. So too have some at Oxford University. "Rather than developing a positive public policy on why the lab is important, members of the university have avoided speaking out. As a result, a minority of animal rights activists have been able to dominate the debate. Now we must turn the tide." Mr Panton thinks there is more at stake here than animal research itself. "Some people's discomfort with supporting animal research signifies a broader discomfort with the goal of pursuing human knowledge and understanding", he says. "What's at stake here is not only medical research, but our belief in scientific progress itself and our belief that we can - and should - improve humanity's lot." I think testing on animals for medical research is a necessity. I can't say it's a good a thing, but if a dog dies so a member of my family can be cured of a disease, then I think it's worth it. I'm a vegetarian and I hate the fur trade, but I love my family. 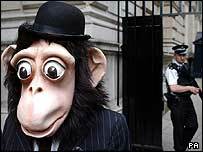 The animal rights lobby's moral code is based on flawed philosophy which, in my opinion, is a thin disguise for a rather nasty brand of misanthropy. As is the case with any lunatic fringe, it is afforded disproportionate media coverage because it is vocal and at times violent. Well done Pro-test for standing up to it and presenting a much more moderate and defensible position! Yet again, the BBC has ignored a key aspect to this debate: the question of the scientific validity of animal research. Thousands of medical and scientific professionals worldwide, such as those represented by Europeans for Medical Progress, believe that animal experiments impede medical advancement due to insurmountable differences between species, and that research should concentrate on more reliable human-specific methods that already exist. My daughter would not be alive today if it wasn't for animal testing. When she was born she was diagnosed as having a very rare malformation of the heart. The medication she was given had been developed by testing on animals and the surgeons who treated and corrected her heart learnt their skills by operating on animals. Mr Simpson clearly does not know what he is talking about. To pick one example, penicillin is a medical breakthrough that we nearly did not have *because* of animal testing. Penicillin was initially tested on rabbits upon which it has no effect and so was deemed to be ineffective for some time. Penicillin kills other animals so if it had been tested on guinea pigs for example, it would have been deemed to be highly toxic and probably would never have been used on humans. The opinions of the 'Pro Test' group are absolutely disgusting. The torture and murder of innocent animals to save humans, is totally wrong. Who gave us the right to live above animals??! If we want to develop human vaccines etc, then they should be tested on humans. The prisons are full of evil people, we should be testing on them. Regardless of the arguments about the ethics of animal testing, the purpose of this kind of research facility is not to save the human race, it is to make profits for drug companies. If the tests on animals give the required result, they are evidence that the drug is worth spending millions of pounds of tax payers' money on. If the wrong result is obtained, this is explained by the fact that animals are different to human beings so the result can be ignored. I'm a doctorate student at Oxford and support the pro-testing protest but being shouted at twice a week when I cycle past the protestors (I work in the building directly behind the building site) has made me too fearful of being targeted to show my face at a protest. It is really sad that such a tiny minority of extremists have allowed only one side of the argument to be put forward. I've always thought that I was in support of freedom of speech and the right to peaceful protest but after being shouted at through loudspeakers for several hours a day twice a week by a handful of people (unless the cameras are there of course) I wonder where the line of reasonable protest versus freedom from harassment should lie. Mr Panton's comments about discomfort with the goal of pursuing human knowledge and understanding is ludicrous. The debate isn't about learning; most activists would not condemn research that does not involve animals, indeed they would probably approve of it. The debate involves respect for life. Many animals will die in discomfort and pain in experiments that have been conducted before and elsewhere. How many mice equal a human life? How many monkeys? We need a clear and open public debate about the extent and usage of animal testing in the UK and by UK companies. About time too. We live in a country where the minority always have their say. Where groups can use fear tactics to bully law abiding citizens into not carrying out their lives as they wish. How dare animal rights activists use terrorist tactics to enforce their views on others. They are no better than Al Quaeda or any other terrorist organisations. I wish Pro Test all the best with their March, it is a very brave but long awaited fight back by the law abiding majority. Issues which affect the well being of humans or animals need to be considered with care. However many of the animal rights protesters who threaten violence and are infact threatening murder are obviously misguided, un-educated and narrow minded imbeciles and thugs. Violence towards 'the men in white coats' is tantamount to the kind of un-thinking violence we see in the Middle East, where a lack of understanding and the ability to discuss complex ideas (a skill which most humans possess) seems absent. Reading this I really want to go and show my support too. It's not that I'm especially in fvour of animal testing, simply that I detest the threats of violence and other extremist measures used by the ALF, 'Speak', and the rest of these nutbags that have no place in a civilised society.